The dust has just about settled after the Vodafone 360 launch and after having no clue at all as to what I was going to see, I now have much more of an idea and am genuinely excited about what is in the pipeline for mobile users. I’ve never really subscribed to the platforms spawned by the mobile giants, either from the carriers or the handset makers. I made a point of avoiding Vodafone Live as when I was ready for mobile web I wanted it to be on my terms. I didn’t want to be spoon fed sport and weather on a naff mobile browser. Wap or no Wap. Then there was Nokia’s Ovi.. Well, being a Mac user there seemed little point. 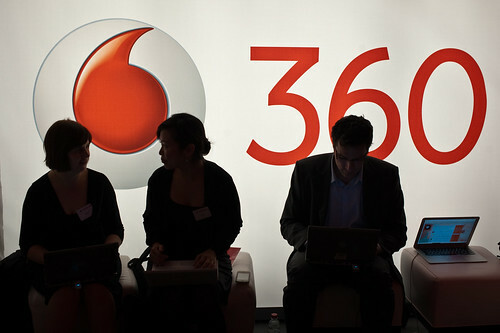 Vodafone 360 may well change the way we look at mobile forever. (Or at least the foreseeable future). If you ever dabbled in ZYB you will have a rough idea of what’s in store. I guess cloud mobile hints towards it too but this is way more than what you get with your dot mac account. This is not just syncing this is a suite of internet services morphing your contacts, status updates and messaging all in ‘the cloud’. This will integrate all your social networks with your address book and provide a two way editable pipeline between you and your contacts. The flexibility and configuration options are mind boggling and I haven’t even gone into the realtime location integration. Of course there will be some people (normally me) screaming “What about our privacy? !” From what I could see this has been taken way more seriously than any other platform developer has bothered in the past. After a few wines were had this conversation on audioboo ended up on Kathryn Corrick’s blog and Terence Eden‘s comment on the bottom explains things better than I could. I thought I was getting close to a cloud mobile experience with my Apple devices and some of the apps I use. But Apple is as Apple does and I’m fed up with the controls and restraints Apple put in place to guarantee ever increasing profits while it’s users are drip fed new tech. Always wanting and waiting for Apple to do the right thing. Jobs acting like a Wizard of Oz over his minions. Vodafone is a massive faceless behemoth yes, but I’m thinking with this move so much is going to decide on the community making it happen. From macro to microcosm. 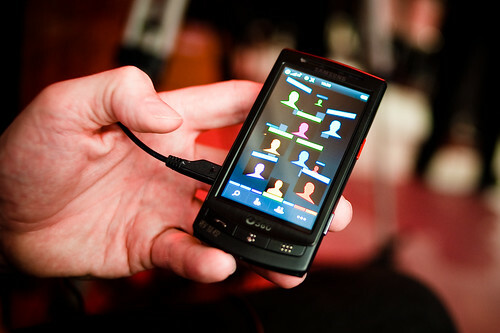 From the coding community building the apps to the cross platform communities meeting in their hand held device. 360 is meant to work on all devices with all carriers. Obviously Vodafone are going to make sure they have the most suitable devices on offer and having got my hands on the Samsung H1 running the LiMo Platform, It’s feels like really decent handset. Sturdy, well styled and feature packed. 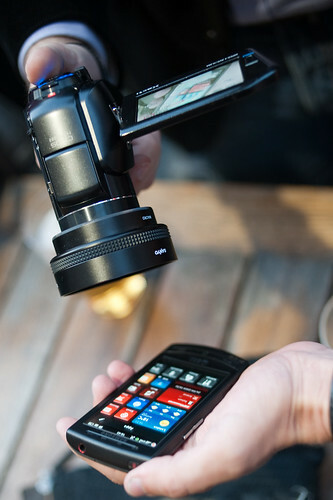 The camera really impressed me as did the fact that this wasn’t another phone trying to win the megapixel stakes. It’s not the number of pixels in a camera it’s how they are used and on a WVGA AMLED display it’s easy to see the quality of your image. On first impressions low light images looked better than some of the compact cameras I use and the 720p video quality seemed good enough for me to leave my other devices at home. The touch screen interface felt a little sluggish compared to the iPhone but I was assured this is still really early days and the interface with be honed and refined as the weeks go by. With the €1,000,000 prize fund in place for coders to collect should they create new and innovative apps I feel we may see an app store that begins with quality over quantity and I really have to get my hands on the phone just to experiment with new apps as and when they begin appear. 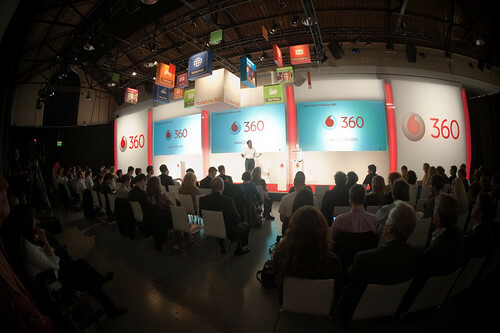 The universal contact list called ‘Vodafone People’ clearly puts contacts and content at the forefront of the 360.com ethos a suite of services that apears to be dripping with social media potential. If a beast like Vodafone has bitten the bullet and finally embraced social media this may be the confirmation all the early adopters have been waiting for. Why is it we have been hanging around this social media fad thing for so long.. Well maybe this is really it. With so much potential to expand and innovate with the mobile communication tools at our finger tips starting to do what we want them to do.. This is what we have been waiting for. Of course in the not too distant future we will no doubt be excited about hardware breakthroughs as battery life, bandwidth and memory capacity going through the roof.. That doesn’t change what Vodafone may have done here right now for mobile communication. I would not have imagined them opening up elements of it’s network to third parties.. This is a different and hopefully leading a mindset. Once you let social networks and open source operating systems enhance your devices, you are placing an awful lot of power into the hands of the community. I am sure the control will stay with Vodafone. The lack of Google maps at this stage hints towards this and they seem to have invested a hell of a lot into this move to take too many risks. Still, I am excited to see where this goes. And with this new level of connectivity bridging previously unconnected networks, I imagine it will be a magical mystery tour where everyone is on the bus. Do you not see it as a beginning.. Will this concept not be emulated by a truly open source platform to run on all devices everywhere for free without any affiliation to the corporates..? If not why not. I think the spaces between the places is ‘where it’s at.’ The all encompassing address book is both scary and exciting. Great ‘boo with Terence, he’s always good fun. Nice coverage too – fingers crossed I’ll get to play with one soon! in my point of view vodafone network is the best network in India,hence best network should have a different scheme from other like free conversation scheme between a couple(single)etc.Best never follows to other,everyone follow to “BEST”.